In the fall of 2006, Lake Country manufacturing introduced CCS Technology. CCS stands for Closed Cell Structures. These are pockets of closed foam, where products are less apt to soak into the foam. The CCS pockets act like small reservoirs for excess polish or wax. When more product is needed on the pad’s work surface, it is drawn up a center column of open-cell foam within each pocket and distributed back onto the work surface. CCS Technology prevents polishing foam pads from drying out and reduces product waste. We incorporated the Lake Country Mfg. 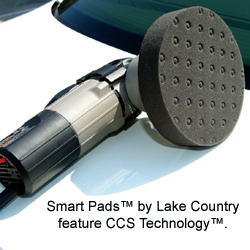 CCS Technology into Smart Pads™ to create the best combination of pad design and foam composition available. Lake Country Smart Pads™ are available in 3.5 inch, 5.5 inch, 6.5 inch dual action pads for dual action polishers, and 7.5 inch and 8.5 inch curved edge pads for rotary polishers. The 7.5 inch pads may also be used with dual action polisher with a 6” backing plate. Choose from five different “cuts”, referring to the ability of the pad to level the clear coat. More aggressive pads will be able to remove or diminish swirls and scratches while softer foam is suitable for wax or sealant application. Access your vehicle’s needs before selecting pads. Click on each item for a detailed description of the pads and their intended uses. Use Smart Pads™ with Lake Country’s professional grade hook and loop backing back plates. Each backing plate is made of indestructible, flexible urethane with precision bonded, industrial grade Velcro® brand hook and loop fasteners. Lake Country Mfg. Backing plates are available in a wide range of sizes, from 2 ¾ inches to 7 inches for rotary buffers to 3.5 inch to 6 inch backing plates for dual action machines. Lake Country Mfg. also manufactures premium wool pads for more aggressive polishing and paint correction. We offer 7.5 and 8.5 inch DuroWool Pads as well as Lake Country Foamed Wool Pads, which incorporate foam molecules to make a denser, more durable pad.